A PDF copy of pages 368-369 of the book Christchurch: The Transitional City Pt IV. 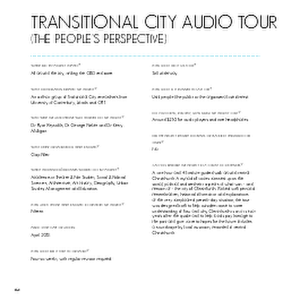 The pages document the transitional project 'Transitional City Audio Tour (The People's Perspective)'. A PDF copy of pages 336-337 of the book Christchurch: The Transitional City Pt IV. 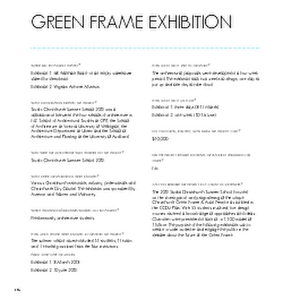 The pages document the transitional project 'Green Frame Exhibition'. A PDF copy of pages 50-51 of the book Christchurch: The Transitional City Pt IV. 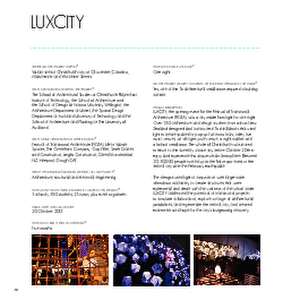 The pages document the transitional project 'LUXCITY'. A PDF copy of pages 164-165 of the book Christchurch: The Transitional City Pt IV. 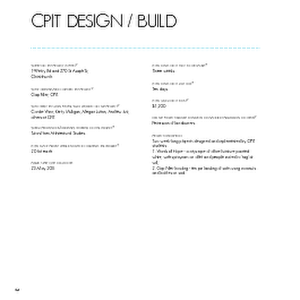 The pages document the transitional project 'CPIT Design/Build'.